Picture this...a lazy Sunday afternoon, Your outside with the sun on your back, a light breeze blowing across your grill, you've got tongs in hand standing next to a red oak firewood BBQ while your yard is permeated with the aromas and smells of Jake's Famous natural BBQ Sauce brand recipe marinated on prime cuts of meat, fish or vegetables. If this isn't you, it easily could be with Jake's Famous BBQ Sauce, Dry Rubs and Condiments. Have we got you thinking about making bbq ribs recipes but don't have a grill...no problem. This Really Good natural BBQ Sauce for sale is absolute perfection on ribs in the oven. The recipe uses very few ingredients and the ribs will come out nice and moist with just the right amount of caramelizing. The steps are simple and included here. Just select your baby back bbq ribs or spare ribs along with Jake's Famous Best Mild BBBQ Sauce for sale and Jake's Tri-Tip, Steak, and Rib Rub or other Jake's Famous Dry Rub. To achieve maximum flavor it's a good idea to properly address your ribs. Meaning the best have the silver membrane removed from the curved side of the rib bones. The best way to do this is after the ribs have been properly cleaned and patted dry take a paper towel and grasp an edge of the silver membrane starting at the top of the ribs. By grasping an edge and pulling toward the other end of the meat you'll start to see the membrane separate. The first few times you pull on the membrane it might appear slippery and may fold back, no matter keep pulling with increased force and the membrane will come off easily. Some say that it's best to remove the membrane while it's cold I like doing it just after cleaning as the membrane is more pliable. Once the membrane is removed generously with the rub and wrap with foil. At this point, I would consider using a true barbecue secret which is to increase the tenderizing of the meat by adding mustard. The mustard must rest on the meat for at least an hour to be effective. Once on the mustard will enhance the meat with a nice tangy background flavor. Then let them rest in the foil for about an hour. Set your oven to 350 degrees. While the oven is reaching temperature set the meat on the counter so that they come to room temperature. Place the meat in foil in a metal baking pan. Cook for about two hours and remove. Open just the top of the foil and lather on Jake's Famous Really Good Mild Best BBQ Sauce covering both sides. After the sauce is applied leave the meat side up with the foil open. Turn the oven to 400 degrees and cook for approximately 15 to 20 minutes at 400 degrees. The additional heat will create a caramelizing effect on the top. Once done remove and cover allowing the ribs to rest for about 20 to 30 minutes. Keep some extra Jake's Famous Really Good Mild Best Barbecue Sauce on the side in a warm dish then serve and enjoy. Additional pairings of coleslaw, corn on the cob and baked potatoes will really make this meal stand up. We love the flavor of our homemade taste Really Good Mild BBQ Sauce for sale. We also love making and adding new flavors to expand the usability of the sauce. Here's a great way to give you options for a totally different product using the same barbecue sauce. We're going to show you how to make raspberry bourbon or just plain raspberry barbecue sauce. 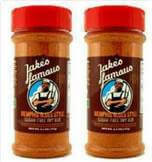 In the case of raspberry sauce take 2 cups of Jake's Famous Really Good Mild BBQ Sauce and add to a mixing pot. Take 4 tablespoons of raspberry jelly or jam and add that to the sauce. Add heat to medium until the raspberry jelly/jam thins in consistency. Stir continuously until the sauce is smooth and warm. Be careful not to burn the sauce. Remove from heat and let rest until the sauce firms again. At this point, you can decide if you want the flavors to meld and mature overnight or if you want to use the sauce right away. As for the sauce with bourbon, all you need is a relatively cheap bourbon liquor. Add 1/4 cup of bourbon to the 1/2 cup of raspberry jelly/jam and 2 cups of Jake's Famous Really Good Mild BBQ Sauce Recipe. Warm the mixture as listed above until the jelly/jam thins in consistency. Then allow the sauce to cool for about 10 minutes before use. If you prefer a little less intensity in the bourbon then allow the mixture to cook for an additional 10 minutes. This will burn off the alcohol and will leave the flavor of the bourbon. Over the past few months we've been working feverishly to expand on our series on Snake Method BBQ. We've taken ribs and chicken and even chuck roast into our Snake Method grill recipe and filmed the results. If you've moved from beginner or novice to intermediate in your skill levels and want to try making the Snake Method BBQ with our Really Good Mild Barbecue Sauces then follow out links to see what we've been working on. Just see our video below for Snake Method BBQ. One thing we will mention is how necessary it is to ensure that your charcoal is properly set for the snake method barbecue. Over much trial and error, we have learned some pretty valuable lessons. It's a good idea to have your charcoal as tightly packed as possible. If the charcoal briquettes have grooves then attempt to match the grooves together similar to blocks. This will allow easier contact and transfer of the heat and eventual burning of the charcoal. Also if you're in desire of wood level smoke then it would be a good idea to purchase charcoal that contains wood fibers embedded in the charcoal. The issue here, of course, is the ability to adequately manage the heat levels when charcoals have been infused with wood. We've found that the temperatures are and can be offset by as much as 20 degrees with the addition of wood. You might consider limiting the number of snake rows once you've experienced a cook with chicken or ribs. To Get the BBQ Sauce brand Click on the Add To Cart button and follow to Checkout. "Overall: This is an exceptional bbq product that every kitchen should have at least one of the best Original Mild Barbecue Sauces. With the holidays coming up soon, this would be a great stocking stuffer! This sauce is great! Now since I live in Texas I typically like some spicy BBQ sauce, but this mild sauce is perfect for the whole family! It is a sweet bbq sauce, but is all natural, meaning no corn syrup, no preservatives, Gluten Free, MSG Free, and 0% Trans Fat. Hubby and I used our sauce on BBQ chicken, smokey links, and even on meatloaf for a zesty alternative to ketchup or tomato sauce! It is a mild sauce, but it has a nice, sweet, garlic flavor. I don't normally like sweet sauce because it is too sweet, but Jake's Original Mild BBQ is the perfect amount of spice and sweetness! It is such a versatile sauce I will be having to order some more soon! "Rich flavored BBQ Sauce, no corn syrup, spread nicely and doesn't burn off, penetrates the meat nicely, acts as a great marinade and is sold at a great price. This is all you need to know about the greatness of this sauce. Give this bbq sauce special consideration and pick it up now, you won't go wrong". Winner of the coveted International Taste and Quality Gold Medal making Jake's Famous Southern Style Original Mild Natural BBQ Sauce for Sale is a winner. OUR STANDING GUARANTEE: At Jake's Famous we guarantee you an exceptional barbecue experience. We promise to treat you like friends and family and to serve you our products that have been prepared with focus, uncompromising quality, and our thorough standards. If you are not completely satisfied, just let us know, and we will honor our guarantee.